A slow cooker cream cheese glazed fondue with 20-minute miniature cinnamon rolls on a stick. This is the perfect party food and an all around great dessert! I have seriously been dying to share this recipe with you all! I had the concept for it about two months ago and then experimenting ensued. When I finally had something I was totally in love with, I just had to get around to taking pictures which was proving a bit difficult as we kept eating this at night as a dessert. But anyways now IT’S HERE! And I am so excited. Because fondue is just the best. It’s fun to do with family, at a party, during a game (hint. football! ), or errr absolutely by myself. Which by the way, I totally had a solo cinnamon roll fondue party at 9:30 AM the other day while the babe was sleeping and I finally had a chance to take these pictures. It was awesome. Except I would seriously miss my pumpkin chocolate chip cookie overnight oats, cookie dough cereal, no-bake chocolate lover’s granola, breakfast chocolate frozen yogurt, and no-bake breakfast cookies. Wow…making that short list makes it seem like all I do eat is dessert for breakfast. But life is is meant to be enjoyed aaaand those options do happen to be (secretly) healthy so why not!? So it’s settled. Dessert for breakfast everyday! So let’s talk about making this delicious dessert. Or we are calling it breakfast now? Okay! Hopefully the few step-by-step pictures above help. It’s pretty basic recipe – the miniature cinnamon rolls are super quick and easy to make. This dessert is best when the cinnamon rolls are still hot, so I like to wait until the fondue has about 30 minutes left and then whip up the cinnamon rolls. If you make the cinnamon rolls in advance. you may want to experiment re-heating them so they are still warm when dipped in the fondue. They aren’t bad cold, just not near as good! The fondue is just four ingredients – powdered sugar, cream cheese, vanilla, and butter. Those get beat together and then poured into a glass or ceramic bowl that is heat proof. Then place the bowl in your slow cooker on low heat and cover the slow cooker for about 2 hours stirring the fondue occasionally. No need to add any water to the slow cooker, just make sure the fondue is in a separate bowl in the slow cooker. How easy is that fondue?! And the whole recipe for that matter? For the fondue, beat the cream cheese (that has been at room temperature) until completely smooth. Beat in the room temperature butter (do not melt) and vanilla extract until smooth and well combined. Slowly beat in the powdered sugar until completely combined. Transfer the mixture to a heat-safe glass or ceramic bowl or dish that will fit into your slow cooker. Place the bowl or dish filled up with the fondue mixture in the slow cooker. Place the lid over the slow cooker and place on low for 1 hour and 30 minutes to 2 hours stirring occasionally. When ready to serve, either leave it in the slow cooker to keep it warm, or pull it out and transfer to another dish. Time the cinnamon rolls to be done when the fondue will be done for best results! For the cinnamon rolls, preheat the oven to 400 degrees F. Spray a miniature muffin tin with non-stick spray and set aside. Remove the biscuits from the package and roll each one out with a rolling pin to get it a little bit wider/larger. In a small bowl, melt the butter. In another small bowl, combine the sugar and cinnamon (Add more cinnamon if desired). Dip each biscuit in the melted butter, shake off the excess and then dip and cover it in the cinnamon-sugar mixture. Shake off the excess. Roll from left to right to form a long tube. Then roll from bottom to top to form a miniature cinnamon roll. Place each one in it's own cavity in the miniature muffin tin. Bake for 8-10 minutes or until the biscuits are no longer gooey and are baked through. (I like to under-bake them slightly, but do what you prefer). 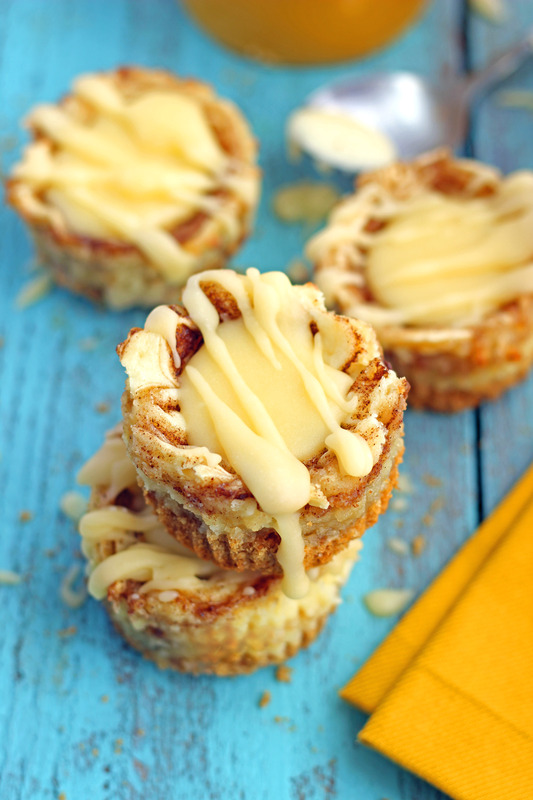 Place the baked cinnamon rolls on popsicle sticks, or cinnamon sticks and dip into the fondue mixture. 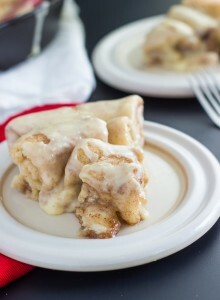 This dessert is best when the cinnamon rolls are hot/fresh out of the oven! SHUT UP. THESE ARE AMAZING GIRLFRIEND. Definitely my most fav recipe of yours to date and now I know what I am eating for ALL the breakfasts! Pinned! Oh.my.goodness. Drooling! I would be dying to share this recipe too and so excited you finally did. Definitely making this…pinned! Chelsea. I’m dying. This might be my favorite recipe on CMA! These look so soft and cinnamony and delicious! And the fondue – yum. and the cinnamon stick sticks – so cute. I want some of these right now! Thanks so much Cate!! Also I totally love the abbreviation – I need to call my site CMA more often 🙂 XO!! This is too much. Cinnamon rolls are my second favorite dessert next to brownies, and anything mini has got my attention. And the cinnamon sticks? I love it!!! say WHAAAAT! This is a genius idea, Chelsea! 20 minute cinnamon rolls + fondue made in a slow cooker is my idea of a party. Ooooh, this is too good! This may be our Christmas morning breakfast this year. This idea is BEYOND genius! So creative and I bet they taste absolutely amazing :). Chelsea, love the idea of a Slow Cooker Cream Cheese Fondue!!! and love love love the mini cinnamon rolls. . totally dangerous . . I could see myself stuffing my face! yumm! Oh my gosh!!! These are amazing Chelsea! Cream cheese fondue? Mini Cinnamon Rolls? In a slow cooker? Best breakfast idea ever!!! I would totally be having a fondue party for one too as soon as my kiddos take their nap. Pinning, I love love love this idea! These are so darn cute! And of course dipping them in that fondue has to be loads of fun, not to mention delicious! Girl, these are super cute!!! That sauce, I can lick it straight from the bowl!! Yum. How flippin’ cute are these!!! What a fabulous idea for a slumber party!!! Oh my gosh, this is one of the best ideas I’ve ever seen, Chelsea! I am so in love with this fondue and mini rolls! What a great idea for a party. Pinned! Will definitely be trying these! I love any recipe dealing with cinnamon rolls! Knock me over with a feather!!!!! Seriously Chelsea – these are my newest favorite dessert ever! Not only are they adorable, but simple to make and dippable too? You have out-done yourself. I can see why you are so excited to share it. Excuse my enthusiasm, but pinned, pinned, PINNED!!! Oh a miniature crockpot would work perfectly!! The bowl inside the crockpot is for regular sized crockpots since the mixture is too small it would burn if put in a large crockpot. and yes you could heat it over the stove just do it on low and stir very frequently until heated through. Then you would probably want to transfer to your small crockpot just to keep it warm while serving. Hope that helps! Mind blown! These are incredible!!! Best fondue ever!!!! Girl, you are BRILLIANT!! Just the title alone had me drooling… And then your gorgeous photos made everything worse. (Or better? Well, you get my point!) As much as I’d like to consider cinnamon rolls a breakfast food, I try to save them for dessert like you instead. The earlier in the day I eat sugar, the more I crave it, and as a baking blogger… Just bad news. But I’d totally break that rule and have a 9:30 AM cinnamon roll party with you! 🙂 Pinned! You always have such unique and creative recipes Chelsea.. and you never fail to surprise me! I would never have thought to make cinnamon roll fondue before, but I am definitely craving some now! Pinned! Amazing! I could see myself enjoying these on a cool morning…or any morning, for that matter! I’m in LOVE! literally these are SO freaking adorable!!! my mouth is watering completely perfect 😉 pinning! These are just delightful! Mmm…. Say whaaaaat?! Girl, this is so creative! Love this! This is beyond genius. This is ridonkulous. That being said, hand over all the mini rolls and no one gets hurt. This is my dream breakfast come true! I love cinnamon rolls, especially the gooey center ones. Now, thanks to these little gems, they are all like that coveted center roll! Pinned! Chelsea this is the COOLEST way I’ve ever seen someone do cinnamon rolls. Who on earth doesn’t love fondue?! Pinned! Oh my holy heck Chelsea. I want to marry you! This is fantastic! You have got to be kidding me. This is why I can’t come to your site, Chelsea! THIS … IS … WHY! Just kidding, I’m here everyday. 😉 But seriously, how did you even come up with this!? I’m making this immediately and I’m eating it all by myself … for breakfast. 😉 PINNED! Such a creative idea, Chelsea! This looks incredible! This looks delish! I was wondering…..if you have a larger slow cooker, you warm the icing, put it in a mason jar, put that in the slow cooker to keep warm, then put the already baked rolls in the slow cooker (beside the icing) with little picks or recommended popsicle sticks, if that would work and i would think solve the issue of keeping both warm. i’m thinking of serving this to a larger group of women. mmmm…….i’m trying this real soon. I LOVE the idea of keeping it all warm together!! My only thought is the cinnamon rolls might get a little soggy from the slow cooker condensation, but hopefully I’m wrong! I’d love to hear the results 🙂 Thanks for the comment Grace! I ended up testing out the idea for my MOPS group. I preheated my crockpot, lined it with a paper towel to collect moisture, made the icing using the microwave and put it in a glass container (with a lid) that fit half of my crockpot nicely, put the mini cinnamon rolls in the other half of the crockpot space (baked the night before a tad more that you suggested just in case they got moist), put a paper towel over the whole thing followed by the crockpot lid and went off to my MOPS meeting. When I got there, everything was nice and warm…..stuck some long picks in some of the rolls (so they get the point) and it was a hit! They never got soggy. Thanks for the idea! You are awesome!!! Thanks so much for coming back and letting everyone know how it worked!! I’m sure your comment will help some people that wanted to try that 🙂 so glad you liked this and thanks again! Great idea with the paper towels! Okay, we need to be neighbors so when you are testing recipes and waiting to post it, I could help you eat it! Loving this cinnamon creation. Absolutely darling! This is seriously the most brilliant idea I have come across in a long time! I cannot wait to try these!!! Hi! This looks amazing and I am literally drooling! Haha but I was wondering if this could be done on the stove or in the oven if you are crunched for time? Thank you! I made this for my daughter’s 13th birthday party paint night and sleepover and it was a huge hit! Out of the 3 fondues that I made, this was the only one that was completely gone at the end of the night (bummer because I was hoping to have some for breakfast!). I didn’t have time to make the cinnamon rolls do i just served it with French toast sticks and cinnamon waffles that I cut into bite sized pieces. It was so good and worked great in my triple mini crock pot. Thank you so much for the recipe! I can’t wait to try it with the cinnamon rolls!